Like the more than 11.7 million users on Pinterest, I often pin pictures of craft ideas. While I have the best of intentions, I rarely (okay, never) actually follow the “simple” instructions to make Anthropologie-inspired scarves, construct cute tote bags without sewing a stitch, or compile collages of gorgeous black and white photos. 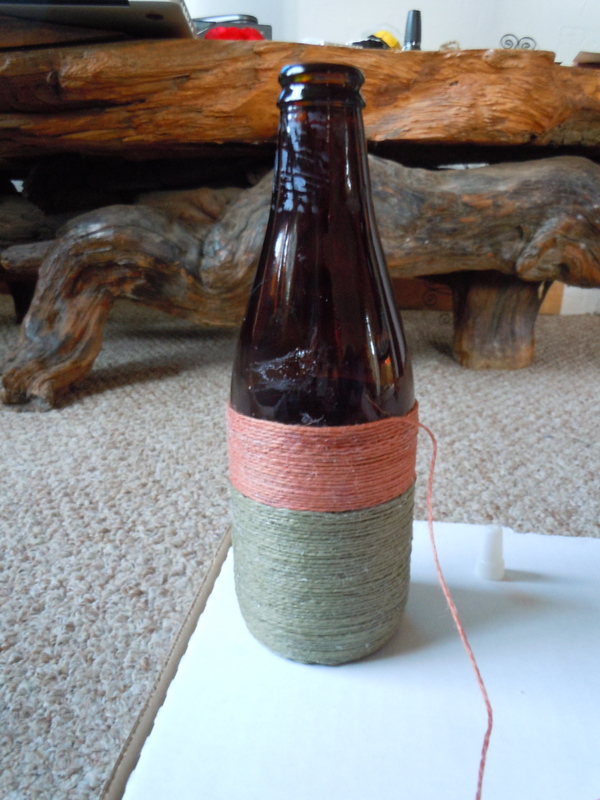 I came across a pin describing “DIY Wine and Beer Bottle Vases.” I like beer. I like wine. I have bottles. It seemed to be a no-brainer. After a trip to Michael’s to get jute and craft glue (I don’t have a hot glue gun and didn’t feel like peeling my skin from my fingers), I got back home and left the supplies on my counter for approximately a week. Allowing the materials to sit for a while lets them grow comfortable in your house. Then, one evening I decided to catch up on some Doctor Who episodes that I’d missed and do some crafting while I was at it. A finished vase. This particular bottle was of Session Black Lager from Full Sail Brewery in Oregon. Very tasty beer; I also like the shape. Three different types of bottles: An Anchor Summer Beer by Anchor Brewing Company (Cali. ), the Session Black and a Hoegaarden Hefeweizen (Belgium). Looking for the various shapes of bottles was almost as fun as drinking the beer. I had lots of help. Now, I didn’t make all three of these vases at the same time, but I did make three of the Session style that first night. I felt very productive and creative. I bought my initial supplies at Michael’s, which was nice because of the selection. However, it’s twice as expensive as what you’ll find at WalMart. Jute = $8.00, craft/glass glue = $8.00 at Michael’s. 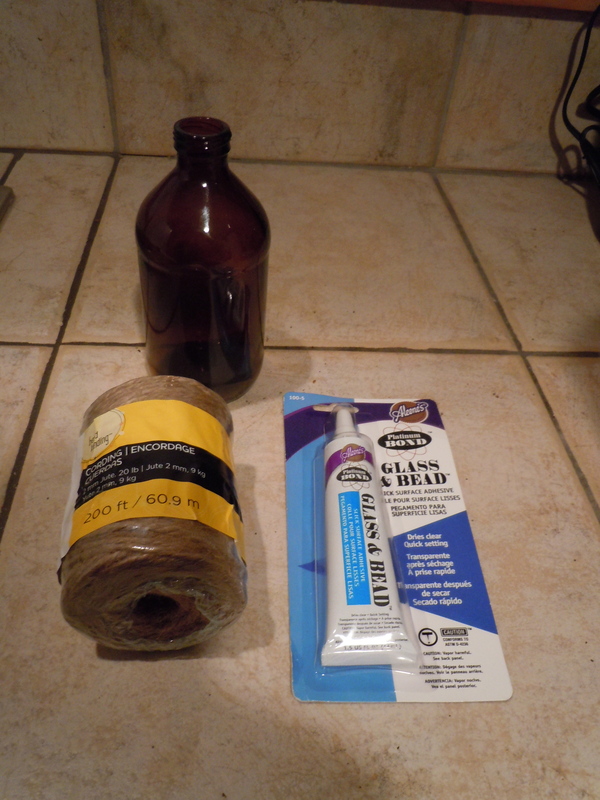 Jute = $4.50, craft/glass glue = $4.00 at WalMart. 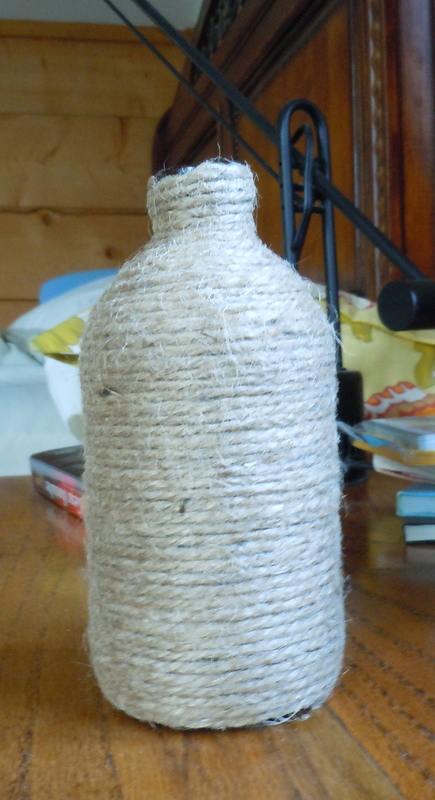 These first bottles are wrapped in a triple weave jute, which means you can knock out several in one sitting. Plus, it’s approximately 60 yards long, so it goes a long way. However, I found some colored jute used for jewelry making at WalMart and decided to try that. It’s much thinner, so therefore takes longer to wrap–and takes more material. Final conclusion? I might order some thicker, colored jute online and see what happens. Half-finished, using the thin, colored jute. I’ve seen some pictures where people used yarn to wrap the bottles. While I’m sure this could work, I have visions of my fuzzy fingers after yarn and glue mix. No, thank you. For the record, I did not drink all of this beer by myself. I happen to have thirsty friends and coworkers. For those of you who don’t drink beer or wine, I was thinking that some of those fancy juice/chia seed/smoothie/$10 iced tea bottles could also work. If you try it, snap a pic and send to me. All in all, I think they turned out really well. It’s a not difficult and will keep your hands busy during a movie or the upcoming political debates, if you’re the type to need distraction during those things. I just gifted a friend with one as a housewarming present and since I haven’t seen it in the recycling bin since then, I think she might like it. 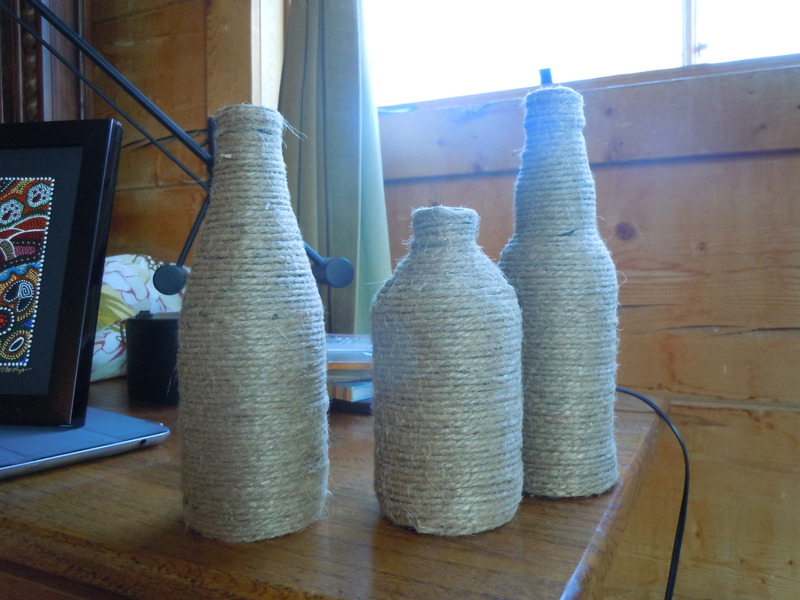 Tags: beer bottles, craft, easy, jute, Pinterest, vases. Bookmark the permalink. Love the “letting the supplies get comfortable” bit. Don’t be giving them all away – I want one!!!! This is a GREAT idea. I do love the colored jute one. I have plenty of empty bottles so might have to give this one a try. Annette, let me know how they turn out!